Although to my current taste, Medieval Death Bot is one of the funniest things on Twitter right now, Corbyn Warnings is running a close second. Corbyn Warnings is a parody account playing on the drumbeat of hostile Warnings by MPs, Labour ‘grandees’ and former leaders who have spectacularly failed, if the polls are to be believed, to warn the UK party’s membership and supporters against the allegedly unelectable Islington North MP, Jeremy Corbyn. The irony that Corbyn, first viewed as a left-wing sacrificial lamb, looks almost certain to be facing David Cameron in Questions to the Prime Minister in a few weeks after winning the votes of a much enlarged ‘selectorate’ seems to have been lost on the Labour establishment. After losing a general election many expected it to win (at least with Ed Miliband as a Coalition or minority Prime Minister), Labour has been conducting a protracted process for electing its next leader and deputy leader. A new voting system weights equally the votes of party members, supporters who pay 3 quid to sign up (many of whom are currently finding themselves being ‘purged’ for insufficient proof of party loyalty) and union members. In part, this selection process was designed to forestall another result as with Ed Miliband and his brother David, where union leaders were seen to have decided the outcome. In part, it’s a logical extension of the One Member One Vote push initiated by New Labour figures such as Tony Blair, Gordon Brown and Peter Mandelson in the early 1990s. All three, ironically, are now issuing Warnings about its result, and Mandelson has been reputed to be using his ‘dark arts’ to try to stop the election in its tracks. I don’t intend to retrace the twists and turns of the campaign, which can be documented by the hostile coverage not just in the Tory and tabloid press but also in the pages of The Guardian and New Statesman (though interestingly not in The Independent). Suffice it to say that the huge enthusiasm and crowds Corbyn is now drawing, particularly of young and otherwise disengaged voters, really took off after a bungled triangulation by the party’s acting leader, Harriet Harman. Presented with welfare cuts by the Chancellor, George Osborne, Labour tied itself in knots trying to find a way of supporting the Tories (to prove that they are not ‘a party of scroungers’) while simultaneously claiming that they would do austerity differently. Only the Scottish National Party, its youngest MP Mhairi Black, and Jeremy Corbyn came out looking good from this mess. Corbyn has been lucky in his opponents. The Blairite candidate, Liz Kendall, has failed to inspire and effectively rebut charges that there is little to distinguish her policy positions from Conservatives. Former senior ministers Yvette Cooper and Andy Burnham have appeared to be wafflers, and in Burnham’s case a flip flopper. Both have arguably sharpened their campaigns in recent weeks (and moved leftwards) in response to ‘Corbynmania’ and Cooper’s answer at The Guardian hustings on what the party stands for was impressive. But their campaigns have now halted in a fairly unedifying contest for second place. Corbyn, a parliamentary veteran who first entered The Commons in 1983, is unapologetic about proclaiming his support for democratic socialism – still not as unmentionable a phrase as it’s become in Australian Labor – and his anti-nuclear and internationalist politics. The bearded MP (who described his whiskers as ‘a form of dissent against New Labour’) is a Campaign for Nuclear Disarmament activist and a recipient of the Gandhi Foundation International Peace Award. 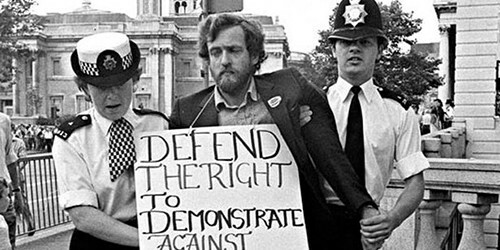 Corbyn has signalled that he wouldn’t enforce positions he has personally taken as leader, for instance on withdrawal from NATO, but this hasn’t prevented a campaign smearing him as an anti-semite with more than a whiff of a Cold War Reds Under The Beds witch hunt. It’s significant that the increasingly shrill and desperate campaign against Corbyn has turned to Dire Warnings that he’s a Danger To The Realm, now echoed by Tories. Austerity has hardly been an economic panacea and it has certainly been a social disaster, and rather than displacing the insecurities it creates and fuels onto immigrants or offering ‘Austerity lite’, Corbyn has tackled it head on. Anyone who actually reads his economic policy let alone its endorsement by 40 leading economists would agree with the Keynesian scholar and biographer Robert Skidelsky that Corbynomics is intelligent social democratic Keynesianism, not some flight of ‘hard left’ fancy. Corbyn has also been the most vocal on climate change and ecological sustainability, again rebutting the charge that he represents a revanchist socialist politics of the past. Despite centrist Warnings that he is unelectable, his policy positions and the honesty and integrity with which they are enunciated are both popular and oriented to the future. His electoral prospects, and the related question of the twin fracturing of the UK party system and the union itself, are best left as matters for another post. What is intriguing about Corbyn’s candidacy and the excitement it has generated is twofold. First, although hardly a fiery orator, Corbyn treats audiences and publics not just with respect but as interlocutors. For me, one of the most interesting aspects of following his candidacy from afar has been watching something in the many videos of his speeches or responses to questions online that we see so very rarely: a politician engaging in public reasoning as well as persuasion. The fit between his persona and his politics is part of this appeal too; Corbyn is a person of integrity, and has been the UK’s most parsimonious claimer of parliamentary expenses. Secondly, the unlikely frontrunner has engaged and inspired generations said to have become deeply cynical about politics and public affairs – precisely because he is not part of the ‘Westminster bubble’. His proposals for participatory policy making, both within and beyond the Labour Party, are fascinating because they are well grounded, as Corbyn himself says, in the ability and the desire of citizens to articulate and reason around their own views. Much remains to be seen, but perhaps the shrill note of Warning is not so much about a politician whose views are radical (insofar as consistent social democracy now is), but also about a politician who genuinely sees the twenty-first century as empowering and requiring genuine participation in democracy. Whether the political caste can defeat such a desire, and one whose appeal to youth and many marginalised citizens is now plain, is a stake at least as great as whether an Opposition Leader Corbyn can prevail in the 2020 UK election.